2017 was a very successful year for the club, the Men’s First team came away with the West D1 title whilst the seconds were runners up in the same division. The women’s team attended every tournament except the January indoor, and improved remarkably finishing 5th in the South West Ladies League, Bath Ladies finished 11th out of 14. Congratulations to Captains Luke Wilmot, Irene Moynihan and Nik Roberts. 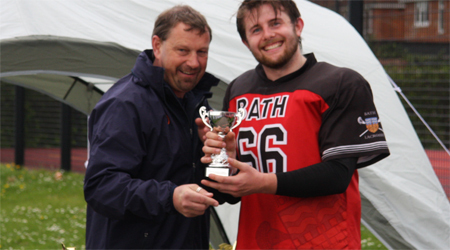 Bath’s attempt to gain promotion against Welwyn Lacrosse resulted in a 19:3 defeat, and this meeting will need to discuss whether the club takes the option to challenge 9th placed Bristol Bombers. The move to Odd Down has proved successful, with the club able to provide 3G training under floodlight, (albeit at a later time than is optimal), and matches have been on either Grass or 3G. A good relationship has been developed with the Café on site for after match refreshments. Parking and changing rooms are all to a higher standard. He Bath Eights has been booked at Odd Down for the 2nd of September and this year will see a ladies section for the first time in the clubs 32 years of running the event. Sadly, the last Bath Eights on the recreation ground was a wash out, and profits were severely affected. The volunteers worked their socks off to keep the event working efficiently and the club extends it thanks to all those that worked so hard on the day. The club membership has been strong, although the finances need tightening up, as several players have not paid their fees. The club fielded 77 players this season, 50 for the Men’s teams and 27 for the Ladies. The club also went on tour for the first time in 25 years or so, 12 players attended the Stockport Eights and generally had a good time in Stockport and Manchester. There were several club nicknames appointed, and it seems the club song is now Sweet Caroline (Ba Ba Baaa). Well done for Laurence Dawson-Smith for organising. From the sound of it there will be more in the future. The Chairman’s cup, last awarded in 1993, this trophy is for the person that, in the eyes of the members, has given a lot of time, effort and enthusiasm to benefit the club. We have Most Valued Male and Female Trophy’s, voted by the players for the player that has had the most impact on the field of play. 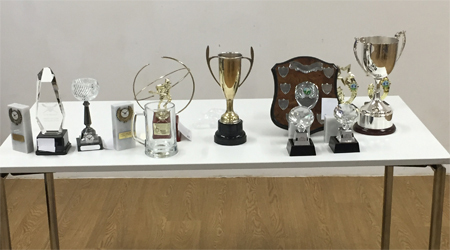 The coaches and captains put their heads together to award the most improved Young players Male and female, plus the overall most improved player open to all ages. This last trophy is again an old one brought back into use. 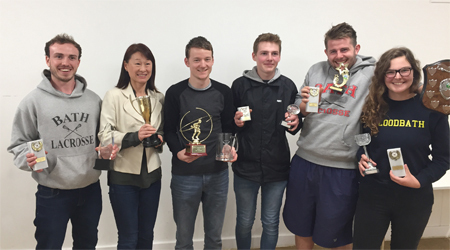 Although no trophy it should be noted that the best turn out for the club would be, for the Men: Luke Wilmot and Ben King who played in 16 official games and for the Women, Meg Critcher who played in 5 of the 6 tournaments. Melksham Oak Community School – Teacher training and running their own programme. The work at Writhlington should bear fruit as there are a few 15 year olds coming through. From my point of view I would like to thank Luke for his hard work, and congratulate the young players that have started to become the backbone of the club. Especially Ben King, both Long and short stick (He even scored a long pole goal in the Stockport Eights), Carmen Williamson who, towards the end of the season was the go to midfield player, popping up with a couple of good goals. Akito Jacques who has afterburners to spare and last but certainly not least Will Tilson who at 15 has been an excellent SENIOR goal keeper, moving on from just a “maybe we’ll blood you” Second team keeper to standing between the pipes against Welwyn in the Playoff game, the boy has talent and guts.